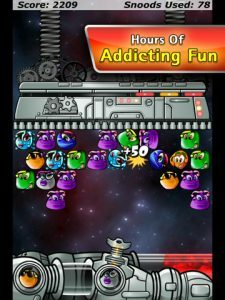 EA Mobile brings their popular puzzle game Snood to the iPad, and it’s never played better. 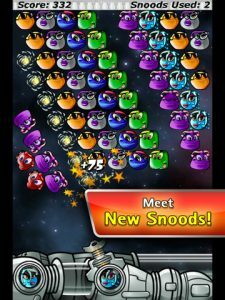 While not the most original puzzler of all time (Snood bears more than a passing resemblance to the Taito classic Bust-a-Move), Snood delivers an enjoyable experience through a solid mix of strategy and skill-based play, mixed with colorful cartoon-like characters. It’s the perfect title for casual gamers, or for those who are looking for an easy-going quick-play game. 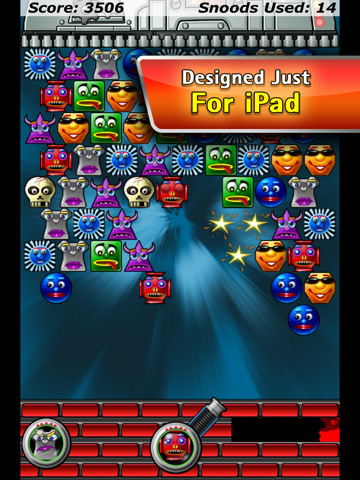 It seems that most puzzle games go with the “match-three” objective, and Snood for iPad is no different. 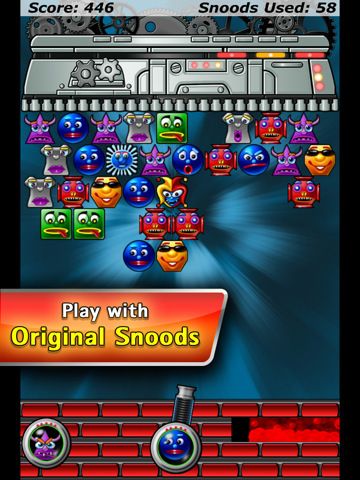 Little characters called “Snoods” hang from the top of the screen and the player shoots Snoods up from the canon below. Connecting three Snoods will cause them to teleport off the screen and safely back to Planet Snood. But there’s more to Snood than just connecting three in a row. Along the bottom of the screen is a meter that slowly climbs after every turn. Once the meter fills, the play-field lowers, giving you less room with which to work. If your cluster of Snoods hits the bottom of the play-field, it’s game over. In order to slow the meter, you must drop unmatched Snoods by matching Snoods above them. To do this, you’ll often have to bank Snoods off the side wall in order to get it in the best position. This element gives the game a hint of strategy, forcing the player to think a few moves ahead, rather than just randomly blasting Snoods. 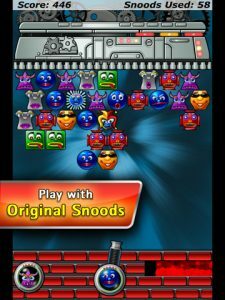 For those that are already fans of Snood, Snood for iPad allows you to play with the “classic” Snood characters, or offers up a new batch of Snood characters. Most of these are merely cosmetic changes, but some Snoods have special characteristics like bomb Snoods, teleporting Snoods, and cloning Snoods. Once you master the classic mode of play in Snood for iPad, the game also offers a puzzle mode, which challenges to player to clear the board using certain objectives. In addition, there’s a story mode that introduces each Snood character and also presents pre-set challenges for the player to overcome. 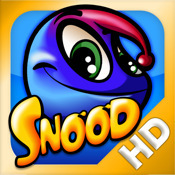 Bottom Line: Snood for iPad is a welcome addition to the already crowded iPad puzzle game lineup. Solid gameplay and a charming aesthetic make it an easy recommendation for under a dollar. Snood is compatible with iPad. Requires iOS 3.2 or later.